The refrigerant in your air conditioner is responsible for absorbing heat from your home in Sugar Land, Texas, and feeding it cool air. It’s important to understand the basics of AC refrigerant maintenance to keep your home’s cooling system running as safely and efficiently as possible. For many years, R22 was the standard refrigerant. However, it’s since been discovered that R22 is closely linked to ozone depletion. This product is now being phased out in favor of the more environmentally friendly R401A refrigerant. You can no longer purchase systems that use R22 refrigerant, and the substance will become illegal on Jan. 1, 2020. If your system still uses this type of refrigerant, make a point to upgrade to a newer AC system before time runs out. If your system is low on refrigerant, you might notice warm air coming from the registers, ice on the copper lines or evaporator coils, and unusually high utility bills. Your HVAC service technician can charge the refrigerant to get it back to the proper level. But this isn’t a long-term solution. The air conditioner doesn’t consume refrigerant. Rather, it cycles it continuously through the system. If your refrigerant is low, you likely have a leak somewhere that needs repairing. Schedule annual AC maintenance to make sure your system has proper refrigerant levels and doesn’t have leaks. Neither R22 nor R401A refrigerant is something you want to come into contact with. Your service technician will make sure your refrigerant is in good shape with every tune-up. If you haven’t scheduled maintenance in the last 12 months, it’s time to have a professional check your refrigerant levels. Contact Conditioned Air Mechanical at 281-201-0356 to make an appointment for your service. 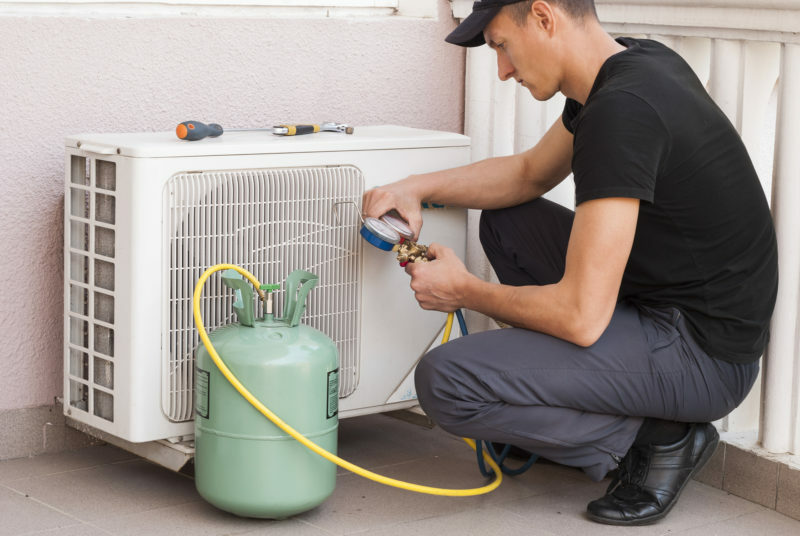 A tune-up is the best way to make sure your refrigerant is at the right level and everything in your air conditioner is operating as it should.